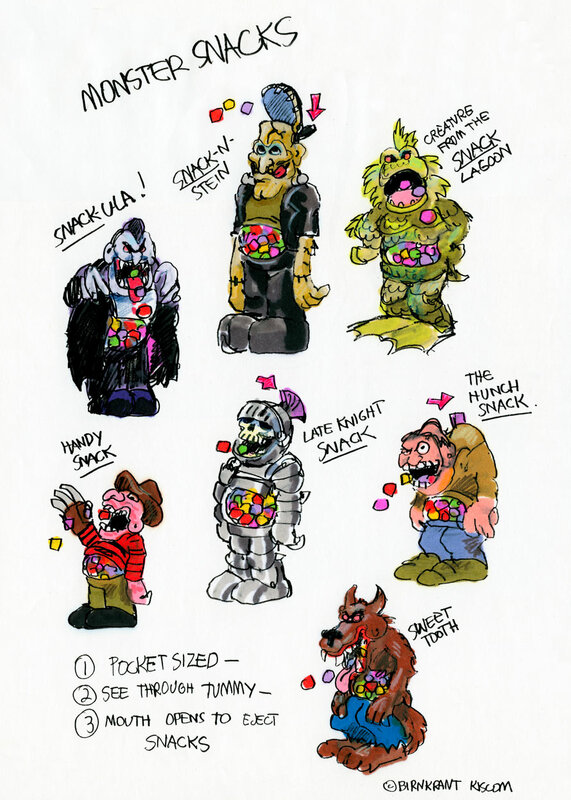 Last, but not least, are “Monster Snacks!” These were my favorites! My powers of pun-acity were at their most potent here. I loved the names, from Snack-ula, to the Hunch-Snack of Notre Dame. And I can’t believe I whipped these drawings out, from memory. So deeply had movie monster iconography imprinted itself on my brain! In the Golden Years of Toy Inventing, my partners, Adam, and Andy Kislevitz, and in later years, their younger brother Noah, would visit the schoolhouse, at least, once a week. They’d arrive, around 10:00 A.M., which was quite early, considering that it took them at least an hour to drive here from New Jersey. We would brainstorm all morning, then, Eunice would serve lunch. After that, the meeting would continue until five in the afternoon. All day long, we threw around ideas, while Andy took extensive notes. During the week that followed, he would type these up. They served as a jumping off place for the next week’s meeting. Whenever a successful product popped up, be it one of ours, or someone else’s, like a bestselling fad, for instance, Andy would inevitably initiate a discussion by asking the following question: How can we flip this toy for girls? Or if it was a girls item, he would ask, How can we flip this for boys? As a real life example, one might say that Maxx FX was an attempt to answer the question: How can we flip Barbie for boys? 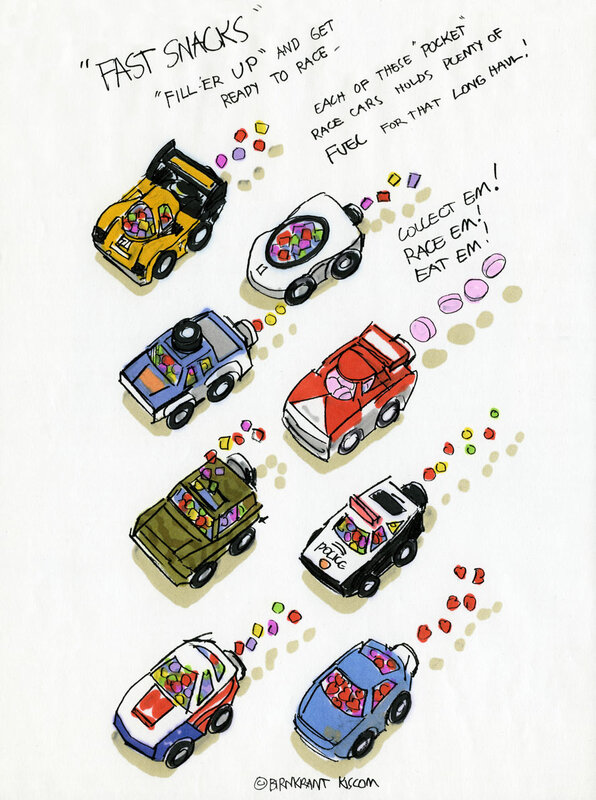 The first of these was automotive, a series of pocket race cars, called, “Fast Snacks.” A kid could “fill ‘em up” with candy, which served as fuel for the long haul! Then, he could: Collect ‘em! Race ‘em! Eat ‘em! 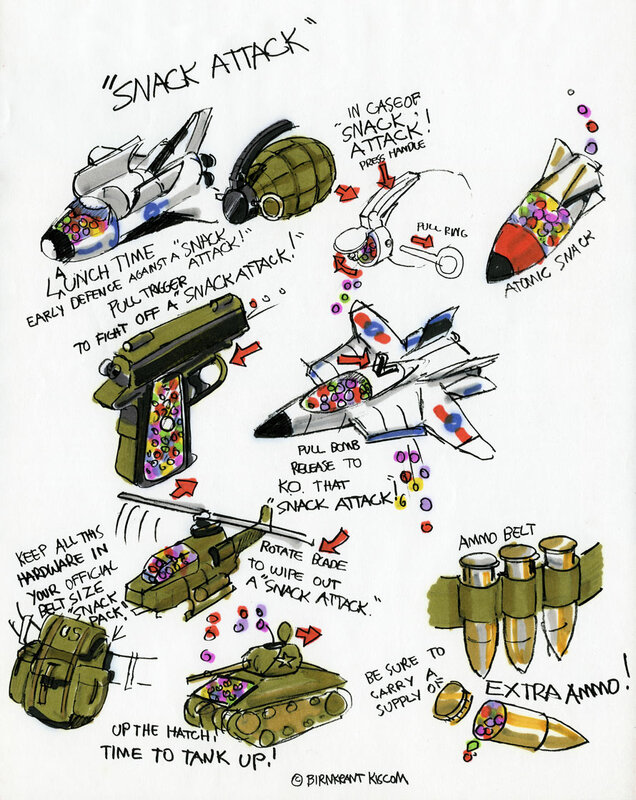 The second group, called, “Snack Attack,”was military. Looking at the names of some of these, twenty-five years later, still makes me laugh. A space shuttle called “LAUNCH TIME.” LUNCH, Launch! Get it? “Atomic Snack! “Time to Tank up! ... Well, you had to be there! 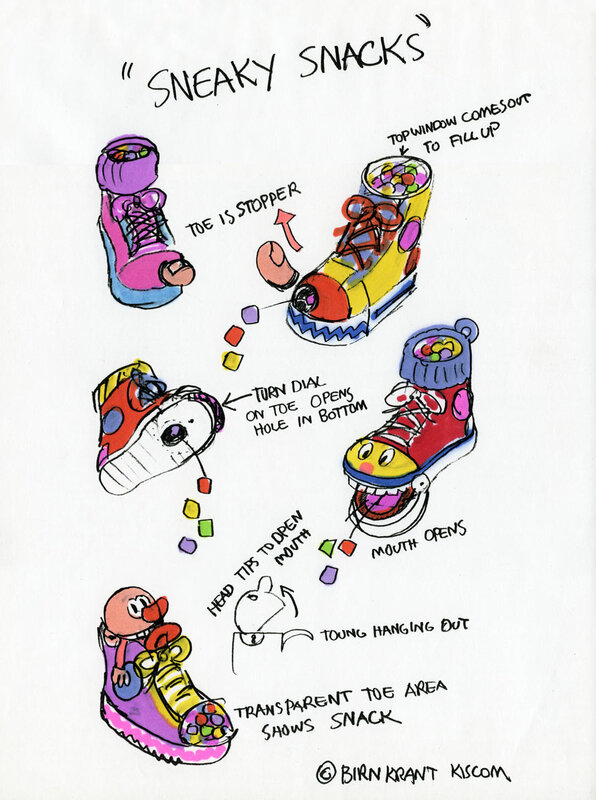 “Sneaky Snacks,” as pictured here, was a series, based on sneakers. These were really sort of stupid, just right to please my juvenile sense of humor. 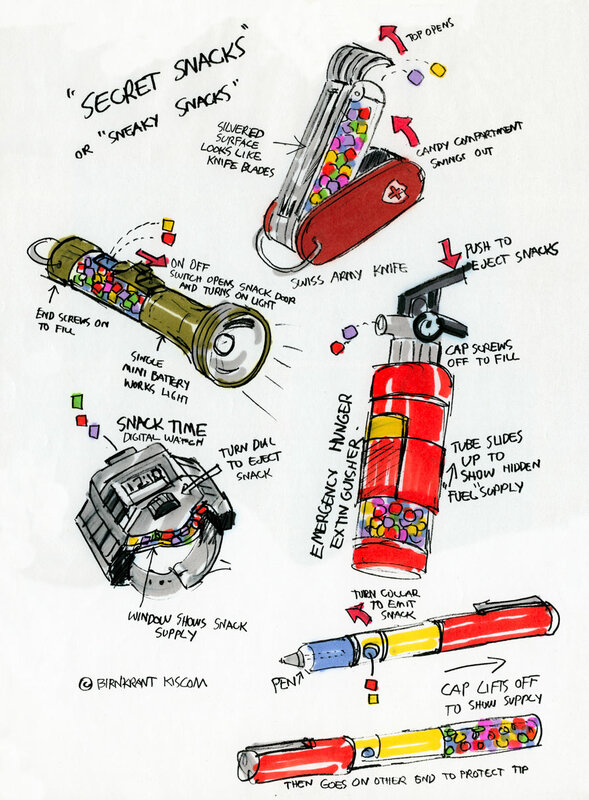 “Secret Snacks” were objects that a kid might be likely to carry in his pockets, common utilitarian objects that also contained hidden snacks.